All the documents you need to amend the articles of association of any private limited company. This pack includes sets of documents. It is perfectly suitable whether you amend articles in general meeting or follow new way of written resolution. The text is simple and in layouts accepted at Companies House. This set of document has been drawn specifically for a company making amendments to its articles of association. The alternative is for a company adopting a new set of articles.The Companies Act 2006 allows you to amend articles of association in two ways: in members’ general meeting or by way of written resolution. Either way you need a special resolution (75% approval) to be passed by the members (shareholders). 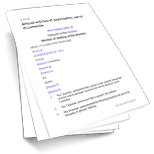 Use this document set to make one or more changes to your existing articles of association. It does not matter whether they are old style or based on the Companies Act 2006 model articles or your own tailored version. We have taken advantage of the new flexibility of law and giving you 2 sets, which are simple and effective - and in plain English of course. So whether you are passing a resolution in general meeting or by written resolution this should suit you well. The draft minutes and notices provided here are of course as required by the Companies Act 2006. These sets of documents do not include the text of your proposed resolution. That is for you to insert. It could be amendment of one article or it may run to twenty articles. The text to amend your articles is simple, in layouts accepted at Companies House. The wording can be added or edited easily. Note: In this set we have provided documents required in both cases. You should use one set. As with all Net Lawman documents, the included drafting notes cover exactly the process to follow and how to edit the documents. We give you comments and suggestions on every document enclosed in the set.